FIVE and a half years have lapsed since Hearts last won at Fir Park and they never looked like breaking that sequence this time round. Lionel Ainsworth’s first-half strike settled what was an uninspiring affair and seriously dented the visitors’ hopes of a second-place finish in the Ladbrokes Premiership. The win continued Motherwell’s excellent recent form - they have now won seven of their last nine matches. Mark McGhee’s side weren’t exactly at their scinitillating best but did enough to earn three points. December 2010 was Hearts’ last victory at Fir Park. After Aberdeen’s defeat to St Johnstone on Friday night, this was an opportunity for them to close the eight-point gap from third to second. It was very much an opportunity missed on a day few in attendance will remember. Jamie Walker’s trundling left-footed effort was the first real chance of the afternoon on eight minutes following the winger’s driving run. Prince Buaben tried a half volley on the 15-minute mark which was comfortably held by Craig Samson in the home goal. Both teams showed an attacking intent with Hearts’ creating more chances in the first 20 minutes. Motherwell fashioned an opening on 28 minutes but Chris Cadden’s low attempt from 14 yards was blocked by Buaben. Seconds later, the deadlock was broken. 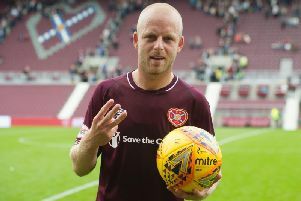 Stevie Hammell’s throw-in was laid off to Ainsworth by Scott McDonald, and the winger cut inside to dispatch a precise low drive beyond Hearts goalkeeper Neil Alexander. Play became notably scrappy from that point through to the interval, with genuine entertainment in short supply it must be said. Motherwell captain Keith Lasley failed to reappear for the second half and his place was taken by young Jack Leitch, son of former Fir Park and Tynecastle midfielder Scott. A timely tackle by John Souttar denied Marvin Johnson a clear shot at goal minutes after the restart. Johnson then turned provider with a clever head-flick into Louis Moult’s path. From around 18 yards out, the striker’s shot beat Alexander but clipped the outside of the post. McDonald dispossessed Buaben 20 yards from goal and homed in on Alexander for what seemed a certain second on 65 minutes. However, the striker’s wayward finish was high and wide as he eyeballed the goalkeeper. Hearts broke upfield and forced a corner, from which Callum Paterson’s netbound volley was expertly saved by Samson. Abiola Dauda and Gavin Reilly were both introduced from the substitutes’ bench as the Edinburgh side tried to source an equaliser. Their efforts were ultimately in vain, though, and the three points stayed in Lanarkshire. Motherwell (4-4-1-1): Samson; Law, Kennedy, McManus, Hammell; Johnson, Cadden, Lasley, Ainsworth; McDonald; Moult. Unused subs: Ripley, Thomas, Watt, Campbell. Hearts (4-2-3-1): Alexander; Paterson, Ozturk, Souttar, L Smith; Kitchen, Buaben; Nicholson, Walker, Djoum; Juanma. Unused subs: Hamilton, Augustyn, Pallardo, McGhee.